AMG totally slams this record, gives it 2 stars. For me, it's really sublime and beautiful and I bet it would find some fans here. You would think with these two in the early 70s, this record would be really dense and noisy, but it's pretty minimal for the two of them. They are new versions of John Coltrane songs and they sure are pretty. Of the five albums from Carlos Santana's jazzy period, four can be described as jazz/rock, altho the latter term is sometimes a stretch. 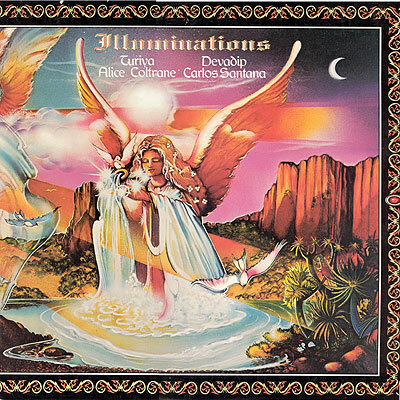 Illuminations, Carlos' joint effort with Alice Coltrane, John's widow, cannot be so characterized at all except for one of the four instrumental tracks, "Angel of Sunlight." This jazz/rock fusion, also steeped in raga, is a showcase for the sort of fine guitar soloing expected from Carlos, as well as Santana-style percussion, good bass work, etc. The other three songs are jazz/classical. They are richly textured orchestral arrangements, heavy with sweeping strings arranged by Alice, who herself plays harp and mellotron. Jules Broussard plays flute as well as saxophone. (Where is that Santana percussion section?) Carlos' chief contribution is exquisite, sweet guitar notes, not ripping solos. The result is a majestic, celestial atmosphere, reflecting Carlos' and Alice's spiritual focus of the time. The song titles tell the story: "Angel of Air/Angel of Water," "Bliss: The Eternal Now," and the title cut. This music is not what you normally expect from Santana, but is very pleasant, very lovely, for sure. Just bought this LP...downloading the mp3s to take on the go...By the beginning of the 2nd spng, I'm already in love!